Friday evening Anita and I decided to be a bit spontaneous and take a little road trip the following day with our kids. Northwood Academy (Savannah Grace and Rylee's previous school) would be playing in the SCISA (South Carolina Independent School Association) State basketball championship for AAA Girls. We have several girls on that team that mean a lot to us and we knew there would be some framily (friends that have become like family) members in attendance. So we jumped in the car and drove to Sumter, South Carolina. The kids were great and the drive was beautiful. We arrived at the Exhibition Center as the AA Boys game was finishing up. First Baptist of Charleston won the title in that game. As the celebration began, Anita came hurriedly back to our seats mouthing something I couldn't understand. She seemed excited but I had no clue. Then finally I heard her. "BILL MURRAY!" You see, Mr. Murray lives in Charleston. His son had just won the state championship and he was there in support. Now here was my moment of decision. Would I play it cool and just watch from a distance? I was raised on Saturday Night Live. I've seen Caddyshack, Stripes, Ghostbusters, What About Bob, Groundhog Day and countless other movies of his a multitude of times. To say I'm a fan would be accurate yet understated. I'd heard of several people I knew running into him around town and nothing short of jealousy would rise up in me every time. But here I was in the middle of his family moment. As a matter of fact, in the middle of the National Anthem for the next game. I stood behind him in perfect stalker form, debating how to go about this. But the song completed and all I could do was be "that guy." 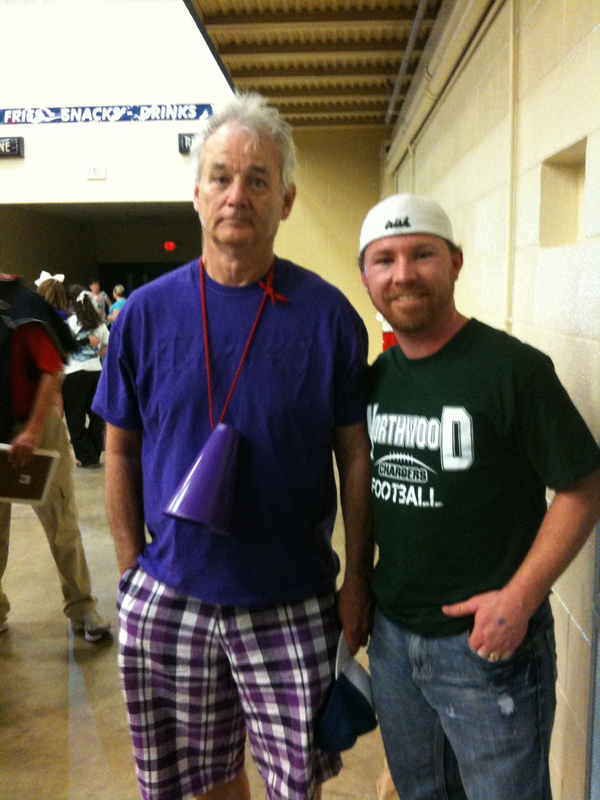 "Mr. Murray, I'm such a huge fan. Could I please get a picture?" I turned to a complete stranger and nervously handed off my iPhone, camera app at the ready, and prayed the picture would turn out. "Thank you so much sir." It was perfect. I was "that guy" and I don't care. I met an icon of comedy. I person who has helped me craft my stage presence and humor. Thank you Mr. Murray for allowing me to annoy you without losing it. I know it seems stupid but it was a huge deal. On twitter, I follow a Pastor in Nashville named Pete Wilson. He’s a great leader doing some awesome stuff at Cross Point Church. He recently twittered a link for a conference he’s speaking at soon. I don’t always click every link I see but for some reason I clicked this one. Once I got to the page I saw something that was quite a surprise. A couple of years ago I asked an old friend of mine Jared to make a video for a Middle School worship service. He did a great job and I talked about it here. If you ever need anything, you should shoot him an email. He’s a very talented guy. Here’s the finished product after I put music with the video he made. So this conference in which Pete Wilson will be speaking has a theme this year called Shift. And guess who’s video they decided to use to promote their conference. Yep, the very video Jared made for us. Here’s the conference link. I just thought it was pretty neat. They used different music but it’s definitely the same video. Way to go Jared and thanks again for being so willing to help us out.